Cut the eggplant into 1/2-inch slices (total 12 slices). Cut the zucchini in half crosswise. Cut each half into 1/4/-inch slices (total 8 slices). Lay the eggplant and zucchini slices on a baking sheet. Brush on both sides with olive oil and season with salt and pepper. Grill until the vegetables are tender, but not overcooked, about 4 minutes per side for the eggplant and 3 minutes per side for the zucchini. In the last 30 seconds of cooking, divide the mozzarella evenly between the eggplant rounds. Re-close the barbecue lid and cook for additional 30 seconds, or until the mozzarella is melted. Lay one eggplant round on each of 4 plates. Top each with 2 tbsp tomato sauce. Next, divide half of the basil between the 4 portions. Top each with one zucchini slice. 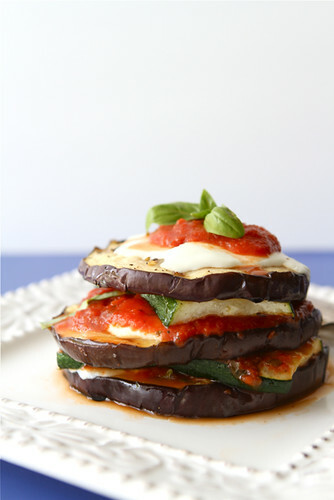 Continue stacking in this order, ending with an eggplant round and tomato sauce. Spoon any remaining tomato sauce around each stack.